While the Andrew Kamanga executive was paying itself hefty allowances, the Football Association of Zambia (FAZ) recorded a deficit of more than K6 million. 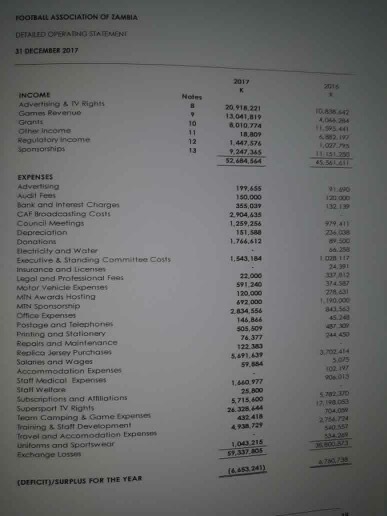 See the attached income and expenditure statement or the the balance sheet of FAZ from an audit report as of 31 December 2017. During this same period, FAZ executive committee members shared more than K800, 000 which they called allowances for organising the under 20 Africa Cup of Nations. FAZ president Andrew Kamanga got K128,000 while his deputy Rix Mweemba pocketed K103,000 with executive committee member Lombe Mbalashi receiving K99,000. General secretary Pasipononga Liwewe was paid K106,000 while executive committee members Elijah Chileshe, Brenda Kunda and Kabaso Kapambwe received K80, 000 each while Lee Kawanu received K64, 650.